If you have planned the journey for Ladakh on a motorcycle then your best choice is the Royal enfield motorcycle. Royal enfield motorcycles are widely available in India as rental option for the tours to Ladakh, Spiti or the any Himalayan ride. See the list and specification of the motorcycle available for rental from Manali or Leh. Experience one of the greatest traditions in motorcycling history in a whole new way. The Bullet Classic 500 EFI is a modern, fuel-injected, low-maintenance motorcycle built in the image of the world-famous 1955 Bullet Classic. It is Built for both on road and off road. Its very common in Himalayas region as it is consider to be best. On the first look, Royal Enfield Classic 500cc looks like it is original Bullet from 1950’s, But when you come closer, you will see that it is a blend between Vintage Motorcycle and modern generation bike. The fully-integrated unit construction engine offers unprecedented fuel economy, higher cruising speeds, and the latest emissions standards. Classic 500 EFI, the powerhouse produces a whooping 27.2 bhp of power and a mammoth torque of 4.2 kgm (41.3 Nm @ 4k rpm) that can make the bike cruise at 100 kmph all day long without giving even the smallest of hitches. 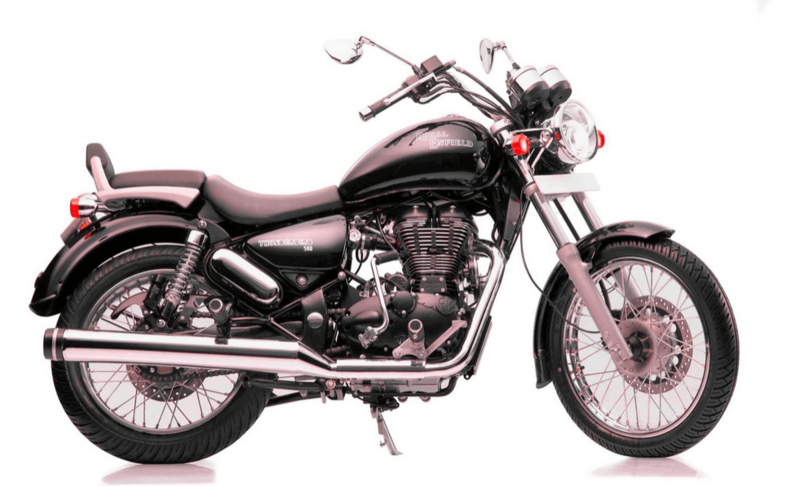 Thunderbird 500 is the first completely modernly equipped motorcycle from the maker Royal Enfield. It is the much improved version of old Thunderbird twin spark. It has the same 499 cc engine as the Classic 500, which generates the same torque and power of 41.4 Nm and 27.2 bhp respectively. It comes with LED taillight and 55 watt projection lamp. 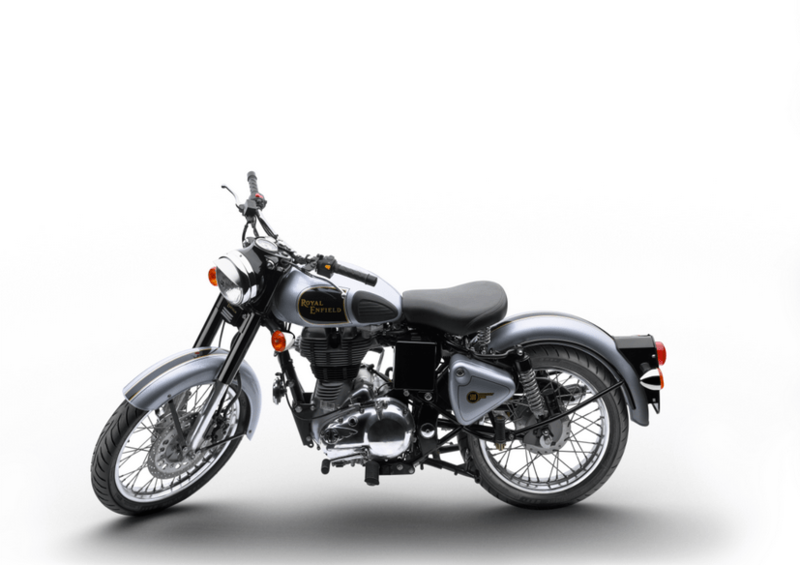 It is the first Royal Enfield to have digital speedometer. The Thunderbird is a solid piece of engineering. One look at it, and it’s easy to believe, it’s a piece of sculpture, carved down from a single block of black stone. The bike is a highway cruiser as well as for rough terrain. 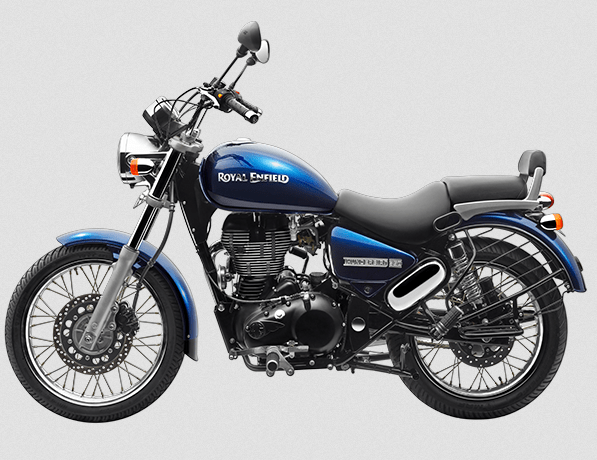 Thunderbird 350 is the first completely modernly equipped motorcycle from the maker Royal Enfield. It is the much improved version of old Thunderbird twin spark. It has the same 346 cc engine as the Classic 500, which generates the same torque and power of 28 Nm and 19.8 bhp respectively. It comes with LED taillight and 55 watt projection lamp. 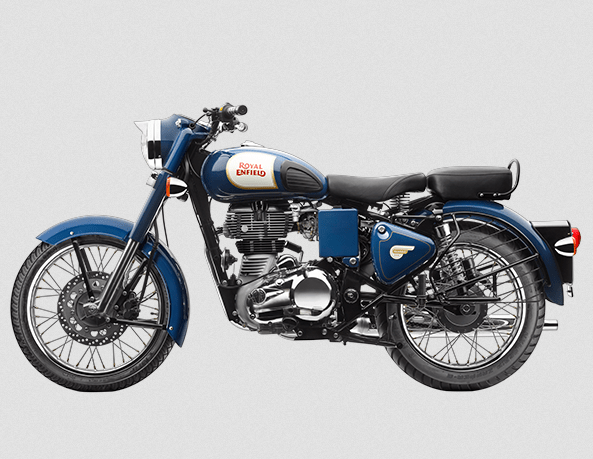 It is the first Royal Enfield to have digital speedometer. Experience one of the greatest traditions in motorcycling history in a whole new way. The Bullet Classic 350 is a modern low-maintenance motorcycle built in the image of the world-famous 1955 Bullet Classic. It is Built for both on road and off road. Its very common in Himalayas region as it is consider to be best. 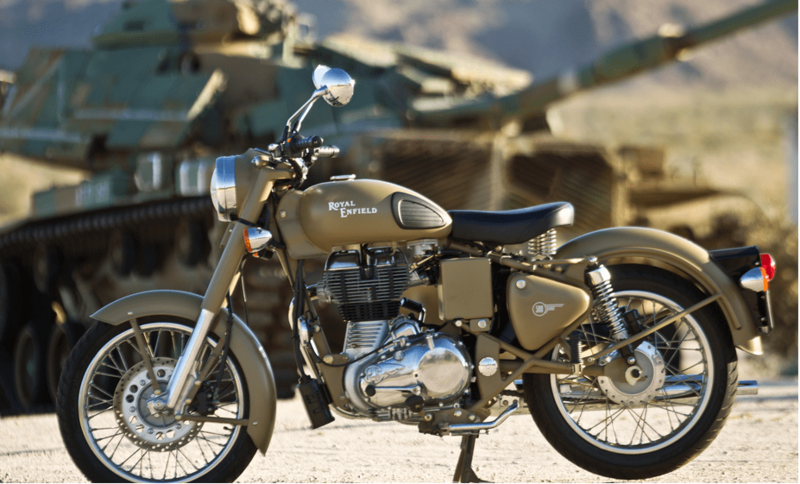 On the first look, Royal Enfield Classic 350 cc looks like it is original Bullet from 1950’s, But when you come closer, you will see that it is a blend between vintage motorcycle and modern generation bike. The fully-integrated unit construction engine offers unprecedented fuel economy, higher cruising speeds, and the latest emissions standards. Classic 350, the powerhouse produces 19.8 bhp of power and a torque of 28 kgm (28 Nm @ 4k rpm) that can make the bike cruise at 90 km/h all day long without giving even the smallest of hitches. The Bullet 500 is particularly the motorcycle with handmade design of the iconic Bullet now powered with a solid 500 cc Unit Construction Engine with Twinspark ignition. It’s new unit lead to better combustion, superior power delivery and improved fuel economy. All in one it is a improved version of old bullet 500. Now technologically equipped with modern advances in engineering Bullet 500 motorcycle still maintains its impeccable lineage it has withheld for decades altogether. Bullet 500, like the all Royal Enfield Motorcycles no less exciting and made for on road and offroad experience, specially for Himalayan Terrain. 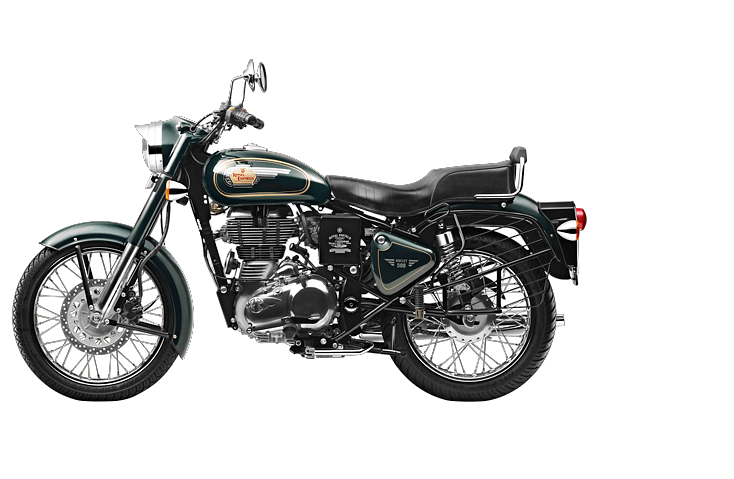 The Electra 350 now comes loaded with the power and reliability of Royal Enfield’s state of the art Twinspark Unit Construction Engine. Along with the UCE engine come’s the double benefits of more power, better fuel economy, more reliability and lesser maintenance. In terms of styling the Electra 350 still keeps things simple following the traditional Bullet but still adding its unmistakably distinctive style to it. Everybody still makes way for the Electra Twinspark. 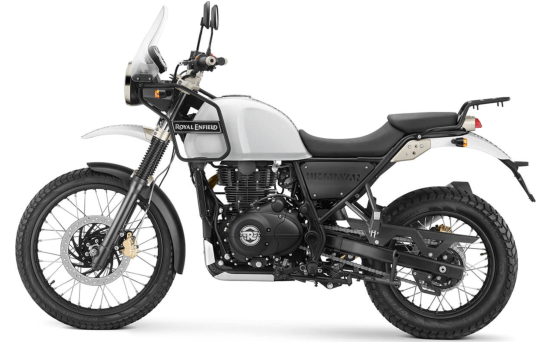 The latest edition to the list is new Royal Enfield Himalayan bike which is ready for multi terrain adventure. It is specially designed for the Himalayan touring. Company says it is perfect bike for on-road as well as off-road.